Now it's time to get serious! We're down to the last eight in the UEFA Champions League and yet we're still no closer to really predicting who will win it this year. The best of the best (minus a few huge names) have got the chance to show what they can do in intense knockout football in the quarter finals. Keep reading to discover how to live stream all the UEFA Champions League games, wherever you are in the world. So how are these ties setting up? Tuesday's second legs are being fought out between a quartet of legendary clubs. Juventus and Ajax are on a knife-edge after drawing in Amsetrdam. And then, possibly the tie of the tournament so far, Manchester United facing Barcelona at the Camp Nou. Last year's losing finalists Liverpool probably had the kindest draw of the round, getting Portuguese champions Porto, and go into the second leg two goals to the good. Wednesday also sees an all English affair as Man City seek to overturn the 1-0 deficit they suffered at the shiny new Tottenham Hotspur Stadium last week. Whoever takes European glory come May 2019, you can be sure Messi, Ronaldo, Pogba, Dybala, Salah and the countless other stars in the competition will make it a tournament to remember. So scroll down to make sure you can grab a live stream of all the Champions League matches you want to see. Scroll down to find out your football viewing options in some of the major Champions League watching countries around the world. And if you're out of the country for this gameweek and are worried that you won't catch the game, don't sweat. With the option of using a VPN service, you can tune into those fixtures no matter where you are in the world. And best of all, it's really easy to do. 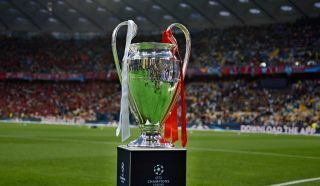 Subscription channel BT Sport again has exclusive rights to show the Champions League in the UK, and will be showing every single match of the 2018/19 competition on one of its TV or online channels. If you're looking to stream matches, the BT Sport app or BTSport.com is where you need to go, enabling mobile, tablet and PC viewing. For those settling down in front of the box, certain games will be selected for 4K broadcast should your TV have those ultra-HD capabilities. If you find yourself outside the UK and want to watch one of the Champions League games, don't worry about geo-blocks on your account – simply grab a VPN and follow the instructions above to live stream the action. In the US, Univision and TNT have the rights to show live Champions League matches. The hispanic-centric Univision has a whopping 137 matches to show across its platforms, which are Univision, Univision Deportes Network, UniMás and Galavisión for TV, and the Univision Deportes’ App and univisiondeportes.com if you want to live stream on a mobile, tablet or PC. For its part, TNT (or Turner Sports) is televising 47 fixtures over the course of the 2018/19 Champions League. But interestingly, every other game is available to live stream from online partner B/R Live. These games are available at pretty reasonable $2.99 per match, or $9.99 per month / $79.99 for the year if you want to access the full array of B/R matches. You can also stream these games via the B/R Live app available on iTunes or Google Play, or watch via Apple TV, Roku, and Amazon Fire TV. For the 2018/19 season, live Champions League matches are broadcast in Canada by the ever-growing sports subscription service, DAZN. The channel will be live streaming every single game of the competition. DAZN packages come in at $20 per month or $150 per year in Canada, though you do have the option of a one month free trial. In Australia, Optus Sport will show every single Champions League fixture live after snagging the rights from BeIN Sports. Optus coverage can be streamed via mobile and tablet with the channel's app, while chord-cutters can also access the service on Fetch TV, Chromecast or Apple TV. However, like the Premier League rights down under, free-to-air SBS will also be showing a selection of the biggest Champions League games this season, so non-subscribers aren't completely frozen out of the action. If you're outside Australia and want to tune in to Optus Sport or SBS, you can use one of our favorite VPNs above and watch the coverage from another nation. The official broadcaster for the Champions League in New Zealand is now SKY Sports. The channel will be broadcasting 138 live games for the 2018/19 competition. Subscriptions to SKY Sports cost $29.90 per month and highlights programmes are available on top of the live coverage. For mobile streaming, users can tune in via the SKY Go app. In India, Sony Pictures Networks (SPN) continues to broadcast the UEFA Champions League, showing every single game of this season's competition. SPN's coverage will stretch across both TV and it's over-the-top service SonyLIV. The ability to live stream all the football to your phone or tablet is undeniably useful - you don't have to miss a single goal, even if you're out of the house. But if you want to stream the football from the internet to your TV, then picking up a streaming box might be useful. Check out our guide to the best streaming media players, where the likes of Apple TV, Roku and Amazon Fire are all included.